The lights dim, a hush falls over the audience and the distinctive voice of Gulzar comes on the auditorium loudspeakers. Starting with a quotation from anachronistically- in a play about the 16th century Tulsidas- the great Russian writer Maxim Gorky. “There are very few good things on earth. What is good is to think about doing good things.” Or something to the effect. When the curtain opens to “Jo Chaho Ujiyaar” I am struck by the elegance of the stage design. 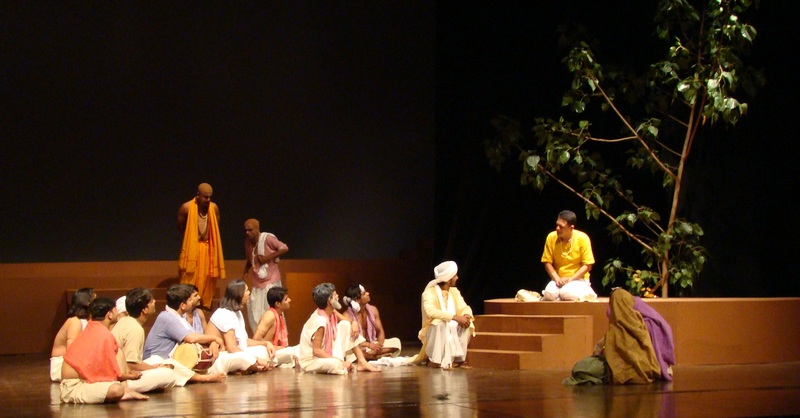 A large and deep stage split into three parts, the area on the left a hut, mostly Tulsidas’ residence, the section on the right a raised platform under the shade of a tree which alternately serves as a public meeting place in a village; a chaupal, a dalaan, a worship place even as we discover through the course of the play. And the central portion, steps leading on to a large platform representing alternately Varanasi town or the famed ghats of Varanasi. Clean and dramatic, that set design. 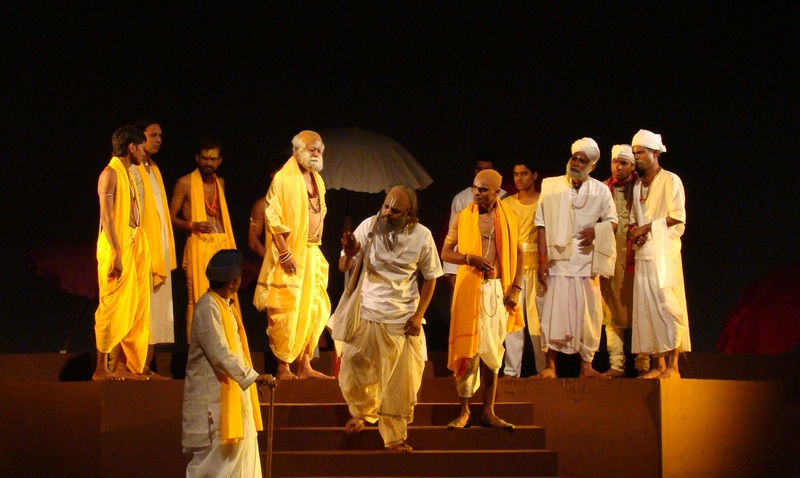 One would have expected Tulsidas to enter early in the play, but all we see in the beginning are villagers and their struggles and vicissitudes in life. This quickly establishes the status of the exploited common villager. Very critical to the development of the idea that was Tulsidas. More about that later. The entry of Tulsidas happens a little later, so well conceived. The stage dark, a glow of golden-yellow spot on Tulsidas standing on the central platform. With the song “Bar dant ki pangati” playing in the background. The young Tulsidas ready to unleash his magic on the world. What follows are the conflicts he has to face. The mahants of Kashi thunder as to how he could do the blasphemous act of narrating the story of Shri Ram in the commoners’ language! The hidden sub-text is that Tulsidas is taking away their command over the populace by narrating the scriptures not in Sanskrit but in Avadhi, the common village householders’ language. And there is also a sub-sub text to the clash between the Kashi mahants, who are traditionally Shaivites (Shiv Bhakts) with the Vaishnavites, the Ram bhakt followers of Tulsidas. Multiple intrigues and sub-plots later, the denoument is reached with the arrival of then Delhi emperor’s- Akbar’s- emissary who congratulates Tulsidas for spreading religiosity among the people. He also presents him a boxful of “Ram-Siya” coins which Akbar has specially minted to express his solidarity with Tulsidas’ mission. What some may miss out on in this intricately woven story is the relationship which Tulsidas shares with the two most influential persons in his life- both women- one his mother and the other his wife. The mother appears on stage only in flashbacks. The relationship between the mother and the son is tender and loving. The background score of “Ram, haun kaun jatan ghar rahihon” when Tulsidas is conversing with his -now deceased- mother is so poignant that can not help but cry. And the beauty is that the roles of the son and the mother are reversed when the scene is being enacted. The son become the mother and vice versa. That Ratna, Tulsidas’ wife, was a strong influence in the poet’s life is very strongly established. In a quirk of fate, the young Ratna is her husband’s soulmate only for a few years. Her demise is fleetingly indicated in a touching scene when Tulsidas is told that she may have drowned while trying to cross the river in a stormy monsoon flood. Ratna was on her way to her maika, to celebrate the saawan month. But even in this relatively short period she has had a telling influence on the course of Tulsidas’ life. Ratna’s ghost appears some thirty years or so later, to reassure the reformer Tulsidas’ that his chosen path in life is correct. The parting of Tulsidas and the ghost of Ratna is very touching. Very inspirational for Tulsidas as she exhorts him to carry on his mission of taking the scriptures, and indeed the Hindu way of life, to the masses. To the grihasth, the common householder. And all this grand action is highlighted by the most wonderful Tulsi sangeet you would ever hear. Some of the best pieces of Tulsidas have been selected, right from the “title song”, “Ram naam mani deep dharoon…… jo chaahas ujiyaar” from Ramcharitmanas, to stanzas from his other celebrated works like Vinay Patrika, Geetavali, Kavitavali. Tulsi “pads” like “Tu dayalu deen haun”, “Kou udaar jag mahin”. Hanuman chalisa is there of course. And his famous stuti to Shiv, “Namami Shamishaan”. Namami has been composed to a pulsating, nearly war-like beat which I had never heard before. In fact I have even heard a version in a recent film called “Dharm” which is sung as a lullaby! But in the context in which this is used (the confrontation between the mahants and Tulsidas) in the play, it seems to be most apt. . Ditto with Hanuman Chalisa. Very different compared with the various versions I have heard. And many, many more songs. Folk songs, mantras, even an old recorded piece of Kumar Gandharv. And yet another recorded dhrupad of Gundecha brothers. The songs are sung by none other than the celebrated Pune-based Hindustani classical vocalist Sanjeev Abhyankar, the one who received the national award for the best playback singer for his very first Hindi film song way back in 1998. A voice of someone who is in complete control of the octaves, a voice suffused with supreme devotion. And guess what this great singer told in the press conference! He said that all the credit for the success of this music should go to Anshu (the man behind this project), as it is his passion which shows up in the final music. What humility on part of this great singer! This music is superbly composed by the music director, Hem Singh, who is little known outside the Lucknow circles. But this gentleman has done a wonderful job. I met him before the play and complemented him on his work. I told him what I felt, “kaljayi kriti”, a work which transcends time. And the celebrated sound designer, K.J. Singh? I have no competence to judge, or even figure out, what he has done. But I do know that he has put together one of the best musical compositions ever. And this jolly sardar from Mumbai, the guy who too is a national award winner for his sound engineering for Omkaraa a few years ago, was confabulating with the auditorium sound guy till the last minute before the play started. Giving them appropriate suggestions, I suppose. And KJ also took Anshu’s family, and me as a hanger-on, for a late, late dinner that evening. Chatting with Anshu all the while as to what all he needs to do before the next staging. And in this thing about great music it would be naive to forget about the performances given by the actors. That the actor who plays Tuslidas, Varun Tamta, has entered the soul of his character is undoubted. The effortless ease with which he straddles the stage playing a 30-year old Tulsidas in act one and then in act two, Tulsidas at 60 years and beyond is enthralling. Tulsidas narrating Ramkatha to the common men in one scene, reasoning with his detractors in the other, a husband in the third and a son in another. The pains and struggles of Tulsidas, and his innate humanness, all reflects so clearly on the actor’s face and movements. 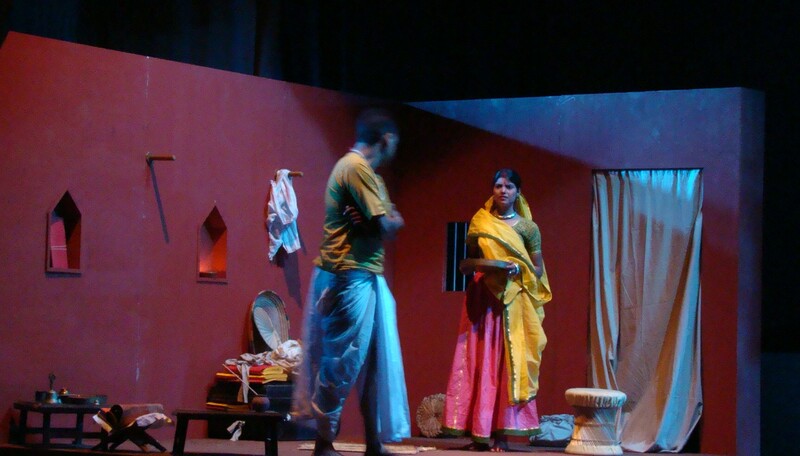 The strong counterfoil to Tulsidas is his young wife, Ratna, played by Manisha. A simple village girl with a mind of her own. And an ability to engage someone of the stature of Tulsidas as an equal. Strong, yet loving. The tenderness of the relationship is well brought out by the director. The director duo of Parijat Nagar and Suresh Lahri have put this large cast together to weave an altogether enthralling story. A story which seems very relevant even today. The story of reason versus religious bigotry. A story of the voice of sanity among the cacophony of maniacal cries. What about the man behind the show, Anshu Tandon himself? Well, he was seated between his wife and I, and “enjoying” the show. He was hoping I would not notice his tears, as I hoped he would not notice mine. We both kept our hankies ready, but at strategic distances from our respective eyes. And Mr M Gorky? Well, his words were prophetic. True, there are indeed very few things good on earth. At the risk of sounding dramatic, I must say Jo Chaho Ujiyaar is one such. And Anshu is one guy, who keeps thinking about good things, and sometimes doing some great things.